Yes, its true- I had not, until about a week ago, EVER tried pho. Hard to believe, unforgivable and inexcusable, I realize. I’m not sure what took me so long- I think part of it was that star anise is mentioned as a seasoning for the famous noodle soup, and me and anything anisey-licoricey-fennely do NOT mix. Now that I’ve finally had it, I am glad that my distaste for the spice didn’t deter me any longer because it was SO GOOD. I’m ready to jump on the pho bandwagon now, a decade or so too late! I get it, folks. The noodles are addictive, the broth is light and flavored only slightly with the aforementioned anise and the abundance of fresh, green mix-ins (mint, Thai basil) is totally up my alley. Why, since I tried the magic noodle I can hardly even remember a life without you, Oh Dear Pho. Thankfully, my honorary little brother is the self-professed Noodle Whore, Mr. Eat, Drink and Be Merry himself, Dylan, who even showed Anthony Bourdain a thing or two about noodles. When J and I had a hankering for noodles, we just text’d Dylan who, being the good, investigative blogger he is (check out his extensive post on Eastside taco stands- it’s AMAZING!) asked us a few questions and then suggested we go to Golden Deli. Being the pho virgin that I was, he felt it was a good place to start and tossed in a comment about the restaurant having “the best eggrolls in town.” He had me at eggrolls- I seriously LOVE eggrolls and haven’t really found one as good as my mom’s. 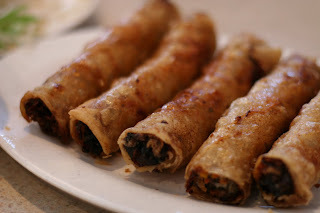 I’d list eggrolls quite high on my list of favorite foods, along with Sun Chips, sushi, onion rings and pasta (not in that order). You could lure me into a dark alley if you had a handful of good eggrolls, I tell ya. Anyway, we arrived at Golden Deli to find every single seat taken- the place was packed- but after a short wait, our names were called and we looked over the large menu. 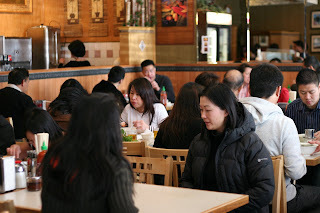 We decided on the famous eggrolls and a bowl of their standard, beef pho each. I’d barely taken a sip of my water when the eggrolls arrived, golden and gorgeous, accompanied by a plate filled with gorgeous lettuce leaves and cilantro. 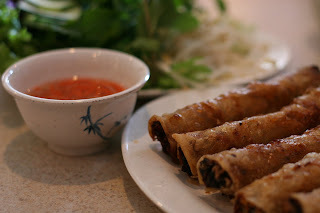 I took one of the large lettuce leaves, put some of the cilantro in it and wrapped it all around one of the eggrolls, dipped the whole thing into the vinegary sauce and took a bite. WOW. 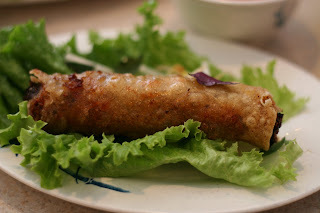 The eggroll skin was super thin and shatteringly crisp; the meat filling was savory and delicious and went perfectly with the greens and the tart/sweet sauce. I don’t know how I woke up each morning to a life without them for so many years. The pho was also delicious and much lighter than Japanese ramen or Chinese noodles I’d had in the past. Golden Deli is extremely generous with their meat- both J and my bowls were filled with tender, thin slices of beef. I ate about half before mixing in some chili paste, which made it even tastier. I felt blanketed with savory goodness and before I knew it, I was staring at the bottom of my bowl. J and I will definitely be making pho part of our monthly diet from now on, and those eggrolls hold a permanent place in my heart. Thanks Dylan, for the rec! Also- birthday shout outs to MIKA and also, to DYLAN (coincidentally! ), two of my favorite people who share a birthday today! I am so jealous! I lived couple of blocks fromthere and would eat at Golden Deli every week. Can't get good pho in NY. BTW, that seafood Chinese restaurant next to Golden Deli is awesome. Their crabs are so excellent! Jin: We'll have to try the seafood place, although I think it moved about 3 blocks east of there, same street but on the other side. Too bad about not getting good pho in NY, but if it makes you feel any better we can't get good pizza here, ha. That is true--pizza is better here (but actually even better in New Haven). 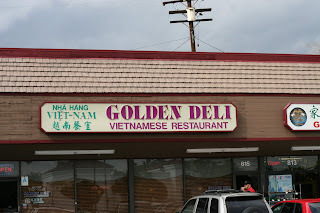 Also, if Golden Deli is too crowded, you should go to Vietnam House that is caddy corner. It's opened by the same family I think (plus they have Vietnamese table grilled meats-I'm not a huge favorite of these but kind of interesting). Finally, I have been reading about this Korean taco truck that goes around LA (Korean BBQ and kimchi on tortillas). Let me know if you ever try it. TAG, congratulations, how does it feel? haha. I can send you to some other places that serve delicious pho. Right now, I've been going to South El Monte for my pho and of course, Little Saigon in Westminster. Once you've graduated from the pho department, J & I will hold your hand on to bun bo hue, bun rieu, banh canh and bun moc land. You're like what's that?! Oh you'll know! have a great weekend. TAG - LOL! 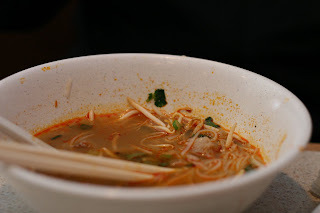 You lost your Pho-ginity..... Dylan has it right...next up Bun Bo Hue, Bun Rieu, Bun Mang Vit! hi and thanks so much for the lead on Golden Deli! we checked it out on friday night and it was fanfreakintastic! YUM! Jin- yes, the Kogi Truck is an absolute phenomenon. They can barely keep up with the demand. It's great to see it take off so much, but if you can't get to it you could probably create a version yourself. Got some bulgogi, tortillas, kimchee and cheese? Diana- I just added you to my blogroll! Sorry for procrastinating! Hey D! Yeah, I popped my pho cherry haha. I'm ready to try all that stuff you mentioned. Kirkk: as long as it has pig's blood in it, I'm in, ha. What a great blog you have! Thanks for visiting my little blog. I'm glad you had your first Pho! (What took soooo long? Hee hee). 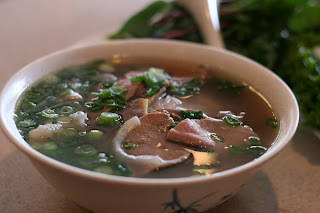 I love Pho...it is just pure comfort in a bowl. that joint is right down the street from me. good times! That egg roll looked so darn good!